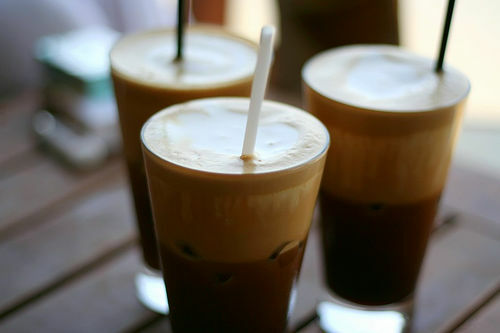 The location of the frappe moment can be as public as a 200-seat cafι in Athens or as private as the two-room apartment three flights directly above it. Its perspective can be as sweeping, spectacular and sunny as a terrace set in the coastal cliffs of Santorini or as confined and gloomy as a windowless coffee canteen in the recesses of a Thessaloniki warehouse building. The apparatus that sets it in motion can be as elaborate as a programmable, multi-speed, steal-bladed, high-torque blender or as basic as an old lidded jar working in tandem with the free hand that shakes it. If you are not in Greece don't get disappointed! The following are the basic instructions and ingredients to help you make a frappe on your own. So if you are not in Greece you can act like you are. Enjoy! Place the coffee, sugar to taste, and 60ml cold water in a shaker, jar or drink mixer. Cover and shake well for 30 seconds or, if using a standing or hand-held drink mixer, process 10 seconds to produce a thick, light-brown foam. Place a few ice cubes in a tall glass. Slowly pour all of the coffee foam into the glass. Add milk, if desired, according to taste. Fill with cold water until the foam reaches the top of the glass. Server with a thin, bendable straw and glass of cold water on the side.